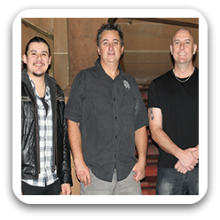 Sydney Band 383 is a dynamic three piece covers band made up of some of Sydney’s most experienced live performers. 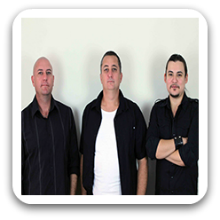 With the combination of outstanding musical talent, professionalism and overall attitude towards making your night a memorable one, Sydney Band 383 is quickly becoming a first choice band for all types of events and functions around Sydney. Sydney Band 383 have an extensive background of performance having worked with successful original artists including Altyian Childs (X-Factor winner), also as members of Sydney’s premier ‘Tribute shows’ including.. Green day, U2, Frankie Valli, Queen, Fleetwood mac and Bon Jovi, not to mention an array of concept and mixed covers bands. Begin your night with an intimate acoustic set while your guests settle in, then have the night come alive when Sydney Band 383 play nothing but huge hits from the 70’s right up to the latest on the charts. Diversity making Sydney Band 383 a must have for your upcoming event. Nothing but the best in equipment ensures fantastic sound, lighting and presentation for those ever important photos. Can perform as a: 3 Piece Band and are available to perform in Sydney and Surrounding Areas.